Mr. Price sends a copy of his paper to Mrs. Hammond in which he has printed the appeal she wrote. Hammond forwards the letter to Martha Berry with a handwritten note at the bottom. 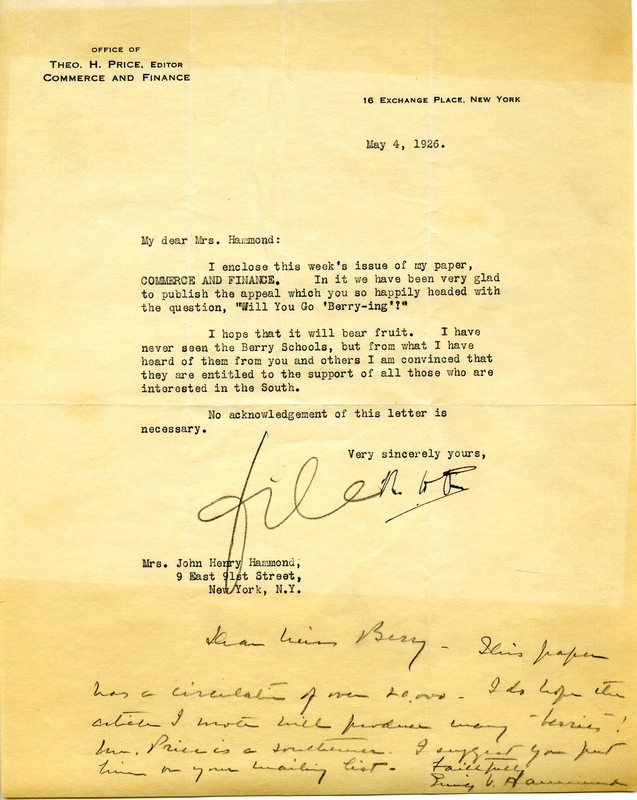 Theo H. Price, “Letter to Emily Vanderbilt Hammond from Theo H. Price.” Martha Berry Digital Archive. Eds. Schlitz, Stephanie A., Sherre Harrington, Angela McCavera, et al. Mount Berry: Berry College, 2011. accessed April 20, 2019, https://mbda.berry.edu/items/show/119. This item has already been edited and is now locked. How about trying an unedited item? This project is a collaboration between faculty, staff, and students at Bloomsburg University and Berry College, initiated in support of teaching, research, and community engagement.